Maybe you’ve been experimenting with digital scrapbooking—a simple page here, some text and photos there—and you’re thinking about ramping up your efforts and taking on a more creative project. Maybe your parents’ 50th wedding anniversary is getting close, or you want to do something special to remember your trip to the 2010 Winter Olympics. Here are ten tips to help you bring a designer’s eye to your pages. 2. Use your resources. Whether you use a digital scrapbooking program or create your pages in your favorite image editing software, you’ll find a wide variety of resources online as well as in printed books and magazines. 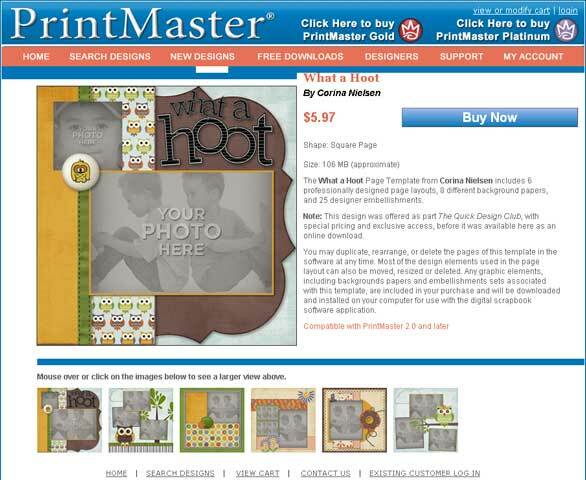 Software programs like iScrapbook ( ) and PrintMaster ( ) both offer online sites with scrapbooking kits of papers, embellishments, and low-cost templates you can purchase. Scrapbooking software sites offer templates and scrapbooking kits you can purchase, download, and use for your own pages. 3. Keep a clear focus. Know which element is most important on your page and create your design so that all other elements support it. For example, if a large photo in the upper right corner of the page is the focal point, place and size your text, embellishments, and shapes so that they enhance—not detract from—the larger image. This gives the page a sense of balance and clarity and helps viewers to focus. 4. Use your best images (and don’t be afraid to edit). When you’re viewing the photo in a regular album or looking at the pictures online, a little fuzziness might not seem like a big issue, but it will be on your scrapbooking page. If you are choosing a photo as the primary focal point, make sure it’s a great image. Use your photo editing software to clarify edges, balance the color, and adjust lighting or red-eye issues before you place the image on your page. 5. Crop to perfection. There’s no rule that says you have to use an entire image on a scrapbooking page. In fact, there’s almost a rule that says you shouldn’t. It’s best to crop your image to the portion of the photo that is the most compelling and focuses the viewer’s eye on the primary element. You don’t want background details or a loose landscape focus to detract from the impact the cropped, focused photo can bring. 6. Color scheme sets the stage. If you’ve ever browsed scrapbooking galleries online, you already know that the color scheme of an individual page jumps out at you long before you focus on the images or words. An icy blue page with dark brown elements offers a kind of quiet, understated look, while a bright red and orange page with sparkling embellishments shouts an entirely different tone. Consider the type of energy your photo—and the story it tells—brings to the page and then choose a color scheme that flows naturally from the photo and conveys the atmosphere you want to create. 7. Balance your page balance. Balance is an important element in a good page design, but too much of a good thing is—well, too much of a good thing. You might center important elements in the page and then place text and embellishments nearby, but sometimes you can hit on a great effect by knocking everything off kilter and putting all your key elements on one side of the page or in a corner. The background of your page—the texture and design of the paper, as well as any layering effects you add—will play heavily in an imbalanced page. Make sure your viewers have something interesting to look at no matter where their eyes take them. 8. Fonts are important. Fonts can be traditional, stoic, playful, or loud. Look carefully at the different fonts you use for your page title, photo captions, and any extra elements (such as notes or journaling) on your page. You may want to make headlines and single-word embellishments artsier than long blocks of text, which you need to make sure your viewers can read easily. 9. Embellish to your heart’s content. Embellishments can add great fun and creativity to your pages. And as you consider what kinds of special items go along with your page, be sure to think imaginatively and find or scan images that are unique to your experience. For example, you might scan a concert ticket, photograph those great retro tennis shoes, or include a 3-D image of a golf ball on the pages you create. 10. Break the rules. Most rules of design—in digital scrapbooking or in traditional page design—are open to debate. There are a few givens, like “leave plenty of space on the page” and “know who your audience is” that are fairly universal. But when it comes to things like color, fonts, effects, and placement, don’t be afraid to shake things up and experiment a bit. It’s your story, after all, and no one will tell it—or show it—better.